We love a one dish meal that we can start in the morning and it’s ready at dinner time! When my son went off to college, he wanted to take the crock pot with him, I reluctantly let him have it. As soon as I gave it to him, I was mad at myself giving in to him and contemplated buying myself a new one. I was going through a list of friends who I thought would most likely have a crock pot and those that would likely lend it to me, while I was driving along a road very near my house I saw sign that said “Free Stuff” with a bunch of old treasure in the yard. I stopped and there was a brand new crock pot ! I simply could not believe it! I thanked the kitchen gods for once again looking after me! The one I gave my son was round and had an on/off button. This one that I found is oval with several (2, 4, 6, 8, 10 hours and warm) options. I haven’t quite fiqured out the precise timing. My son left me a frozen chicken on the counter today. When I asked him where he got it, he smiled and didn’t say anything. He likes to keep me interested. I know it is a local chicken and he most likely helped someone with a chicken slaughter and this was the payment, but for now he is not saying. Here on Martha’s Vineyard, if you raise meat birds and want help with the slaughtering, we have a mobile processing unit that will come to your location and set up a slaughter facility. It is fairly basic; there is a trailer that carries all necessary supplies for processing and travels from farm to farm with an experienced crew. It is shared between multiple producers and allows growers of all sizes to become involved in raising poultry. You have to have a minimum of 25 chickens, and be willing to help in the process and provide running water, but it is a very efficient system and 25 birds is about the right number for a family. Some families I know raise 200 chicken and sell some hoping to break even on the deal, although that is rarely the reality when all is said and paid for. 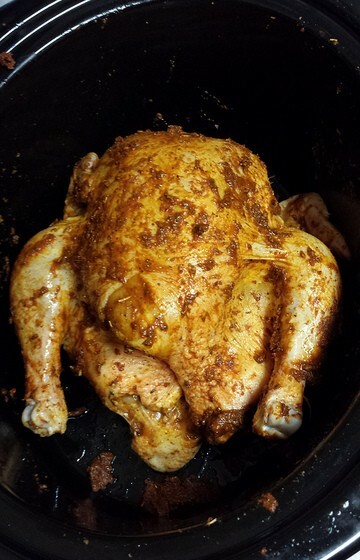 I decided to crock pot my bird. I poured olive oil on it, sprinkled it with some berber spice and I just happened to have a bag on frozen pearl onions. I sprinkled those on top and shoved some down the sides. I will admit that the bird was “packed” into the crock. I had to put a heavy pot on top of the lid to keep the lid closed, but I set the temp to slow 8 hours and off I went for the day. When I cam home, I placed one whole preserved lemon which I cut up into the blender. I poured off 2 cups of the stock from the juices and olive oil and put that in the blender and blended until it was smooth. I poured it over the chicken and served it with sautéed greens and cauliflower. I initially set the timer for 8 hours because that is the time I expected to eat, but at 6 hours I checked the bird and the meat was falling off the bone, so I turned it to warm until we were ready to eat, which was a good 1.5 hours. It was perfect, but next time I would cook it on low at 4 hours.